1962 1963 1964 1965 Polara - Fury - Coronet - Belvedere - Satellite. High Quality OEM Style Replacements. Includes header seal and all left and right side roof rail components(2-left, 2-center & 2 rear sections). Fits the following Convertible Models. 1962 - 1964 Dodge Polara. 1962 - 1964 Plymouth Fury. 1965 - Plymouth Belvedere - Satellite. Has a very smooth skin that is free of exposure cells or flaws. Is composed of micro-closed cells that are uniform in size, providing even compression and sealing so you won't have to slam your doors. Is jet black, not ash gray, for a refined, concourse look. Each parts comes with a certificate of guarantee. 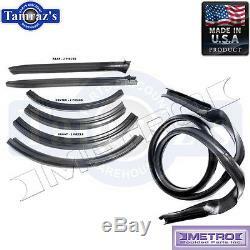 The item "62-64 Mopar Convertible Top Weatherstrip Seal Kit RR4500E USA MADE New" is in sale since Saturday, November 7, 2009. This item is in the category "eBay Motors\Parts & Accessories\Car & Truck Parts\Glass\Auto Seals". The seller is "tamraz" and is located in Naperville, Illinois.